Spokane has a new radio station, and it's a format that hasn't been in out market for the last few years. iHeartRadio has re-branded their station at 96.1 into Alt 96.1, a radio station with an adult alternative / alt rock format. Also, the station has been re-assigned new call sign KFOO. Previously, the 96.1 was a country format known as Kix 96.1 which has historically had the lowest ranking of the 3 country stations broadcasting in Spokane. Kix 96.1 has had a 1.5 market share, lacking behind the top station 99.9 Coyote Country with their 5.0 market share. But, iHeartRadio intends to keep a country station on the air in Spokane. That station has moved to 99.3 which is actually a translator station of KZFS 1280 AM. 1280/99.3 launched not long ago and had a short run as a contemporary Christian station. The country station will now be called Kix 99.3 . Locally iHeartRadio also operates 98.9 KKZX, 103.1 KCDA, Kiss 98.1 and News radio 590 KQNT. The relatively small plot of along Appleway, just northeast of the Northwest Blvd exit off of I-90 in Coeur d' Alene has been proven to be a great spot for new restaurants to open. Two chains that are new to the area have already opened there, one being the Inland Northwest's first Cracker Barrel which opened last fall. And, the other is Coeur d' Alene's first Firehouse Subs location ( Spokane's opened a few months earlier ). Just weeks after the first ever Incrediburger & Eggs opened to much fanfare in Downtown Spokane, another location is already in the works for the Ramsey Crossing development of Coeur d' Alene. This new restaurant will be right next door to Firehouse Subs. We're told the menu will be very similar to the Downtown Spokane location. Incrediburger is a fast casual style eatery with gourmet burgers, egg sandwiches and boozy milkshakes. 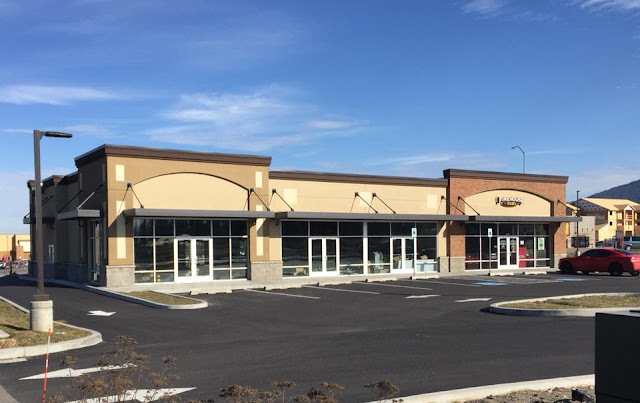 We are still waiting on the details but have confirmed that the Spokane based Thomas Hammer Coffee chain will join the same building as Firehouse Subs and Incrediburger. It looks like this store will be much like their others and include a drive thru lane but we'll re-post when they share more. Could more new places be coming? It's very likely that more places could be coming to the same Coeur d' Alene neighborhood. In fact, the non-restaurant related Idaho Central Credit Union just broke ground for a new branch and office building across Appleway from Ramsey Crossing. There is also a vacant lot still for lease directly at the corner of Ramsey and Appleway and another new strip mall is still largely up for lease to the east on Appleway just past Lowe's ( where the new Pool World store is ). Looking for a couple of new places to check out? Then head to area around the Spokane Valley Mall tomorrow ( Thurs. Mar. 15th ) as a highly anticipated new mall store and a new pizza business not far away will both be having there first day's open. These 2 popular children, babies and toddler clothing brands will open there first duel branded store in Spokane market within the Spokane Valley Mall. In fact this is Oshkosh B'gosh's first retail store in Spokane, Carter's however already has a store at Northtown Square, across from Northtown Mall. The new store is located on the first floor of the mall right by the center court area. The space is about 5000 square feet. Maybe a mile or so from Spokane Valley Mall, on Mansfield Ave. nearby the Valley YMCA is a new commercial building. The first tenant there, a workout facility called Specialty Training,Inc. is already open for business but now the second tenant is ready to open. That will be the 3rd location of Brother's Office Pizzeria, their other stores are at 32nd & Pines on the south side of the Valley and in Liberty Lake. They offer a menu of several handcrafted specialty pizza's, build your own pizza's , sandwiches, salads and a small amount of other items. Adult beverages are also available . Keep watching this site for more business openings in Spokane Valley as construction is continuing for a new Tuesday Morning store on Indiana by Staples and a gaming store Fun Unlimited should be opening next month in Spokane Valley Mall. Plus, construction work is coming soon to a new strip mall out front of Yoke's ( the former Trading Co. grocery store ) at Sprague & McDonald . And, at the new Ponderosa Village shopping center off of Dishman Mica Rd. The former Wonder Bread building at 821 W. Mallon has been undergoing a dramatic renovation and expansion for the last several months. But the building, which is now known as Wonder Spokane, will be wrapping up their project this Summer bringing new office space along with an artesian market space. The market will be called Wonder Market and will be a 12,000 square foot space for local retail and food vendors, we'll likely have more on that coming soon. But, first the office space as it was announced just today that the owners have partnered with commercial real estate advisor JLL and NAI Black to begin marketing and leasing that space. They say the arrival of this office space will being some relief to the tight market for large scale office space locally. And, what's exciting about the large office space is they even hope the space might be used by a tenant from Seattle, Portland, San Fransisco or similar seeking to expand into the a more affordable growing market like Spokane. Wonder Spokane will feature three full stories and a large basement for office users, totally 100,000 square feet of new space geared towards growing creative companies. The space will offer high ceilings, abundant natural light and will be unique as it's a historic over 100 year old building. Plentiful parking will be provided on site and the building will be topped by a rooftop deck featuring views of Riverfront Park and Downtown Spokane. Keep watching this site for upcoming tenant announcements, the Wonder Market space and other information! 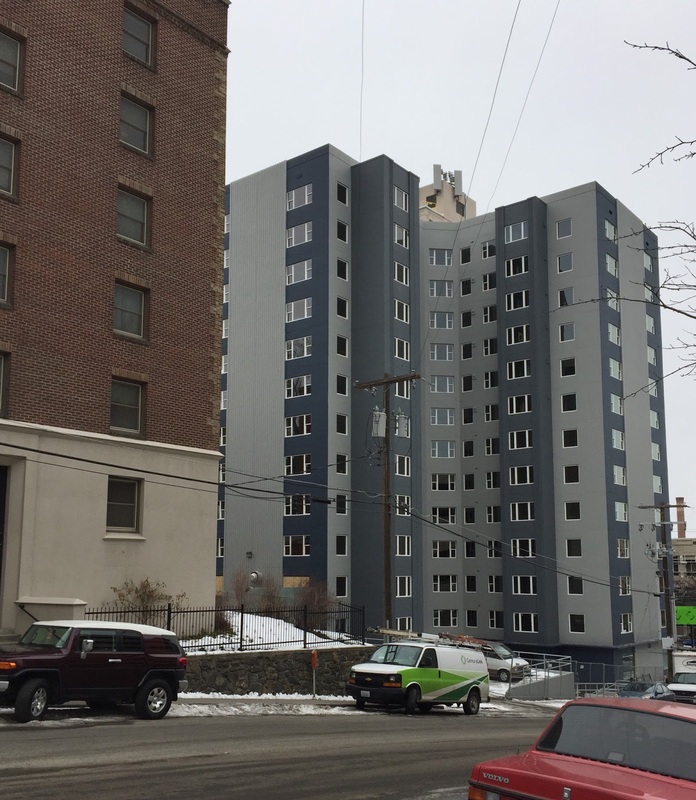 This week we at Inland Northwest Business Watch we're given a tour of quite possibly one of the coolest building renovation projects going on locally. That project is the renovations of the Cooper George building at 707 W. Main by Deaconess Hospital. The Cooper George was originally opened in 1952 also as an apartment building, over time the building transitioned to a senior living / assisted living ending that run as a complex called South Hill Senior Living only a couple of years ago. But now, an Oregon based owner and Baker Construction have been running full renovation of the building. This time back into an apartment complex, but it'll be an apartment complex that's in a lot of ways unique for Spokane. The apartments will go by the name Cooper George Apartments with 144 total apartments. Studio, 1 bed and 2 bedroom apartments will be available and tenants will be able to move in April 15th. And, I'm told there has been a lot of interest already, as is to be expected as after taking the tour I can honestly say the building is cool, the views are awesome and the location is basically un-beatable just a few short blocks away from the Downtown Spokane core. In addition to the 144 apartments there is some very limited commercial space that will be leased out on the ground floor. One space with a kitchen intended for something like a café and a medical office / retail space on the back side of the first floor. But, the apartment tenants will also be able to use the ground floor as a sort of hang out, I'm told they even plan to hang the historic Cooper George sign that used to be up on top of the building on the walls of the first floor. Leasing offices, a conference room, Amazon storage lockers and a fitness center are also planned to be on the first floor. Upper floors will be apartments until you get to the roof, there a rooftop deck will allow residents to relax and overlook Downtown Spokane. There will also be a place to store / work on bikes, but for those with a car, parking is included in the price of rent. I'm told only a few units will not include a parking space. The apartments are modern spaces that take advantages of the good bones of the historic building. In fact the building is just a block from I-90 but there is no highway noise given the thick sturdy construction. Inside the apartments are stainless steel appliances , gas ranges, washer & dryer , central heating, air conditioning, white quartz countertops and more all in a secure building. Oh, and they are pet friendly too. So, with all of that how much will it cost to rent an apartment at the new Cooper George? It depends partially on what floor you want, floor plan, etc... . But, rents will start at $920 per month for a 415 square foot studio, 1 bed starts at $1235 and 2 bed starts at $1675, but parking and all utilites are included in the rent. We would like to thank Cooper George for allowing us to see the building! Thank you! Plans are calling for a new Taco Bell location to be built in place of what is today the Five Mile Heights Pizza Parlor. But, the key word here is may as this is still very much in the planning phase. CLC Restaurants of Missoula, the owner of all of the local Taco Bell franchises, has filed " pre-development conference " documents with the City of Spokane to build a new Taco Bell on the site, which is located at 6404 N. Ash. The plans call for a demolition of the current structure and the replacement with a new construction Taco Bell. The new Taco Bell would be 2573 square feet with a drive thru lane, indoor seating for 52 and a small amount of outdoor seating. Parking would be added on the south side of the lot along the new building and few spaces up front near the roadway. The building at 1305 N. Hamilton has been several businesses since the landmark Bulldog Tavern closed in 2012. The last place, Scotty's Doghouse left late last year and now another group is giving it a go with this weeks opening of the Logan Tavern. The Logan Tavern's owners have done some remodeling to the interior of the building and are now open as a neighborhood style hang out. And, even though they've only been open for about two days now we are already hearing very positive feedback about this new place. Logan Tavern is named for the Logan neighborhood, where the bar is located. The tavern has a full bar with some specialty drinks and a food menu that they describe as traditional pub food kicked up a notch. There is several burgers and sandwiches like an ultimate grilled cheese and the kennel wrap. There is some wonderful sounding appetizers, soups and salads and more. There is even a couple of dessert items like Pint O' Donuts. The Spokane area's second Sketchers Outlet store is now open for business in Spokane Valley. The new outlet can be found in the Evergreen Marketplace shopping center at 14008 E. Sprague Ave, in the same plaza as Office Depot. The new store is roughly 10,000 square feet and carries the full line of shoes manufactured by Sketchers. The company produces casual and athletic shoes for men, women and children and their outlet store's merchandise is often priced lower then at other retailers. Sketchers now boasts about 2600 retail stores and the first Spokane location also remains open for business at 9324 N. Division, it opened about 3 years ago. A hip new pizza place will be opening soon in Downtown Spokane. The local establishment, Boombox Pizza, is under construction now and they are planning for a opening sometime in April. Boombox Pizza will be in the former Revolver Bar space at 221 N. Division, right in the heart of a section of Downtown known for bars and clubs. And, given the young party crowd Boombox Pizza will be open late, till 2am. In fact, the new business will have a liquor license of their own serving serving a full bar of cocktails, beer and wine. But Boombox Pizza won't be just a party place as they will also serve up delicious pizzas for lunch and dinner as well. The menu isn't out just yet but we're told it will consist of pizzas, wings, salads and more.